"What on earth could pre-thawed turkeys, Eva the dolphin, and toothpaste tubes squeezed from the middle have to do with the success of your business? Everything. Results Rule! is that rare business book that you can't put down, and you shouldn't, because the lessons within aren't just helpful, they're vitally important. Don't put Results Rule! on the stack of books you mean to read soon. Buy it, take it home, and read every word before your competitor does." "Most business books give you everything you need and want to do, except the only thing that matters--getting results. This book is well written, with great examples, stories, and real advice that will actually show you how to improve your results. Buy it--read it--heed it--and watch your results improve." "Results Rule! delivers practical ideas that will keep your organization on course for success in a competitive marketplace. Randy Pennington offers ideas that work if you are on the frontline or in the executive suite. He has nailed the essence and importance of culture." "If you hate your competition, it's because they're beating you. If you want your competition to hate YOU--read Randy Pennington's book, and give it to all your people." "Six rock solid concepts plus real examples in a quick and easy read equal real results. A guide to differentiating your organization in the marketplace." "Randy's business savvy and expertise are evident throughout this book. His thoughtful analyses produce vital points for any business that wants to grow and thrive in the twenty-first century." 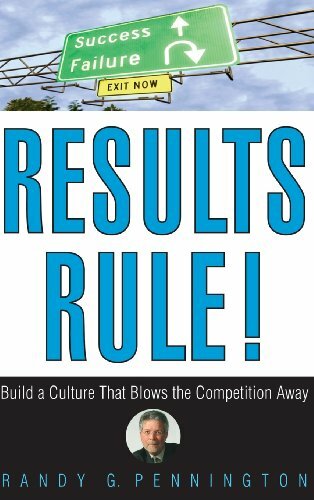 "In a very engaging, quick read, Randy Pennington cuts through the hype of most management bestsellers to propose a deceptively simple premise--a culture that never loses focus on the desired result and always wins. Pennington takes you by the hand and shows you how to take an honest look at your own organization, then act immediately to create and nurture a culture that achieves results day in and day out. Results Rule! is one of those rare books you'll keep close at hand for years to come."